We know which celebrities are making the kind choice to help turkeys by not eating them this Thanksgiving. So now, we’re looking at what will be on their plates, with a rundown of some of our favorite celebrity-inspired vegan recipes, just in time for the holidays. Warning: We strongly advise against reading the following on an empty stomach! Known for her own line of vegan cookbooks, actor and animal rights advocate Alicia Silverstone isn’t shy about promoting other delicious vegan recipes. 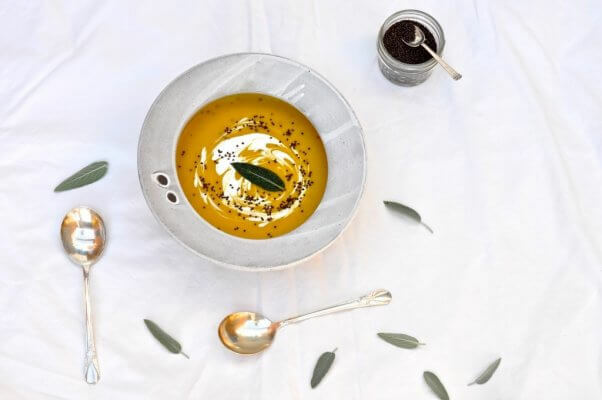 She recently shared this hearty, velvety soup by plant-based blogger Oh, Holy Basil just in time for the holidays. 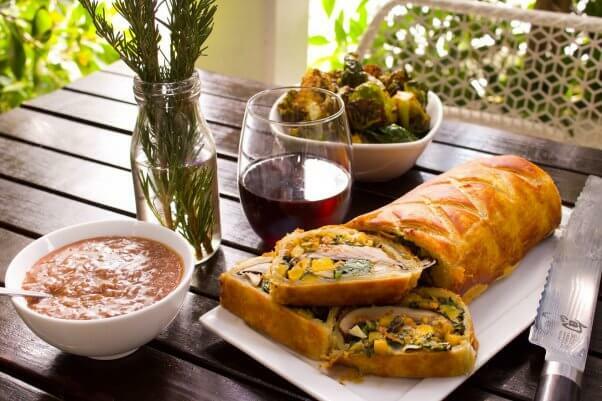 With its pumpkin base and a dash of nutmeg, it’s a perfect starter for your Thanksgiving spread. Luckily, Brussels sprouts are having a bit of a renaissance and showing up on menus everywhere. This recipe is from one of our favorite vegan celebrity chefs, Chloe Coscarelli, and it combines the tang of pomegranate juice with maple syrup, which adds a hint of sweetness to this healthy veggie dish. Sweet potatoes are one of those Thanksgiving staples that are very easy to make vegan—which is great because they’re so healthy and delicious. 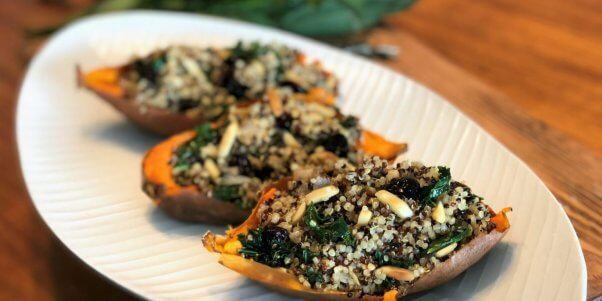 Animal rights crusader Jane Velez-Mitchell recently shared this Quinoa Stuffed Sweet Potato recipe from vegan chef Leslie Durso, which can make for a hearty main course or a tasty side dish. In addition to being a longtime vegan and PETA campaign star and starring in a certain TV show called The Big Bang Theory, Mayim Bialik is also an accomplished cookbook author. We can’t wait to try this delicious version of a traditional chocolate chip cookie recipe with pumpkin to add some flare to a vegan Thanksgiving feast. Every year in the U.S., roughly 85 million turkeys are slaughtered and eaten for Thanksgiving, Christmas, and Easter alone. And that’s just about a third of the 240 million turkeys who are raised for food all year round. Going vegan can help save animals’ lives—365 days of the year. PETA is a participant in the Amazon Services LLC Associates Program, an affiliate advertising program designed to provide websites with a means to earn advertising fees by advertising and linking to Amazon.com.